Looking for a quiet family resort in the beautiful island of Zakynthos? Check out our detailed, up to date website and find out all the information you will need to organize an unforgettable vacation! Located on the sou th east coast of the island, just 5 kilometers from the capital city, Zante Town and 3 kilometers from the airport, it is one of the most renowned tourist resorts on the island. The long sandy beach with the shallow, clear blue waters is protected by the National Marine Park because it is a nesting area for the endangered Caretta Caretta turtle. During the summer months, the female turtles lay their eggs. 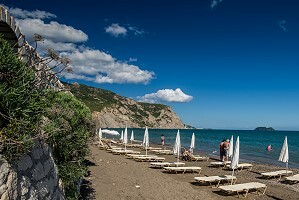 The nests are protected by the members of the park and therefore there are some areas on the beach off limits to guests where there are no umbrellas or sun loungers allowed. There are parts of the beach that are organized with small canteens that offer refreshments and snacks and space to park your car along the beach. The resort is spread across an area with a lot of green like olive trees and various shrubs. There are all types of accommodation like studios, apartments, villas and hotels, shops, bakeries, traditional tavernas, restaurants with international dishes, car, bicycle and motorcycle agencies, tourist agencies, swimming pools open to all, a water park, a mini golf club, horse riding, water sports and many more activities guests can enjoy. Browse through our website and find interesting information about all aspects of your stay. Get a taste of the beautiful beach, view accommodation proposals, book directly with the owners, find out more about the island's natural beauties and attractions and plan fun activities before you get there!